Thanks to longtime GWS pal Debbie Goard of San Francisco’s Debbie Does Cakes, Yoda cake technology has taken quantum* leaps forward. Straws, wooden dowels, or uncooked spaghetti are usually favored in confectionery Jedi lightsabers. Instead, Debbie opted for a glowstick to adorn this 16″ tall Star Wars cake. 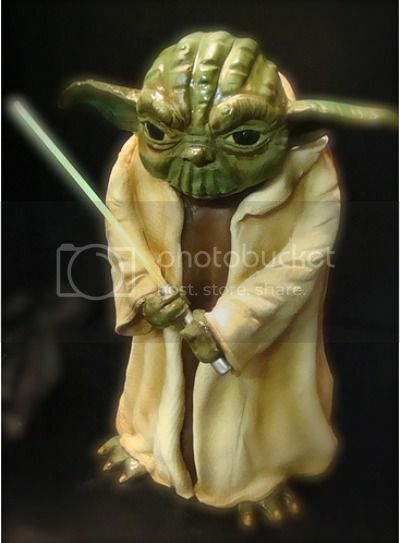 Finally, a Yoda cake with a lightsaber that will properly glow! You know… for at least 11 or 12 minutes. Debbie told me the cake filling “flavor was a rich devils food with a vanilla buttercream.” Not to mention the hydrogen peroxide and phenol. Tastes like chicken! You can find Debbie’s work all over this bloginating machine, but I highly recommend the Darth Maul cake. * “Quantum” means moderate and sensible, right?